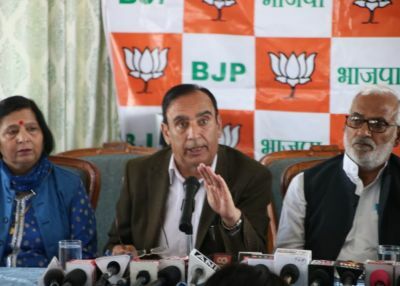 Shimla: Confident to repeat its performance of 2014, BJP taking potshots at the Congress for failing to announce its candidate from Hamirpur Lok Sabha segment. Senior BJP leader Narinder Bragta, while interacting with media here today, taken a jibe at the Congress and claimed that the grand old party leaders are shying away from contesting the election. Bragta said that facing eminent electoral defeat Congress leaders are avoiding to face electorates. Congress has surrendered before election, Bragta quipped. Bragta also criticised the Congress manifesto and said that it plans to destroy institutions and help terrorists. Questioning the tempering with the sedition law, Bragta blamed Congress for sheltering anti national elements. He also blamed Congress manifesto for weakening the armed forces. He asked Col Dhani Ram Shandil, Congress Shimla candidate to clear his stand on the Congress leaders’ statements on surgical strike and poll promise to repeal sedition law. Being ex-army man what is his take on Congress manifesto and continuous rant on surgical strikes. 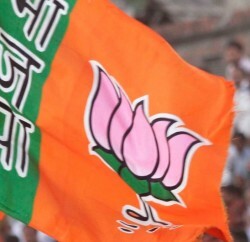 Hailing Mr Modi tenure, Narinder Bragta stated that the BJP is canvassing on the plank of development and strong leadership. He claimed that the BJP is committed for even development of the nation. 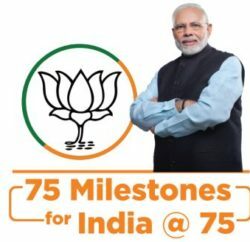 He said that Narender Modi has given stable leadership and on that BJP candidates will win all four seats of the state and NDA will also form majority government. 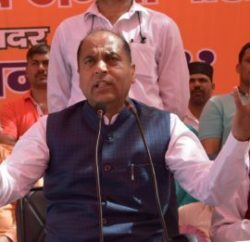 Speaking on the tenure of Jai Ram Thakur, senior BJP leader termed it wonderful and full of achievements. Even opposition leader and senior Congress leader Virbhadra Singh has lauded the work of Jai Ram Thakur in an interview with private news channel, Bragta further added.